If you told me a couple years ago that I would be composing music for something that could be described as equal parts sculpture, instrument, and flamethrower– I would be skeptical. However, that’s exactly what I did leading up to Burning Man 2010. A huge group of people, many of which I’m proud to call my friends, decided to build this project called Syzygryd. Syzygryd is a town square for the collaborative creation of music. It’s a public space, it’s a sculpture, and it’s a professional musical instrument. It’s the most beautiful expression we can imagine of the joy we take in community, music, technology, fire, sculpture and architecture. 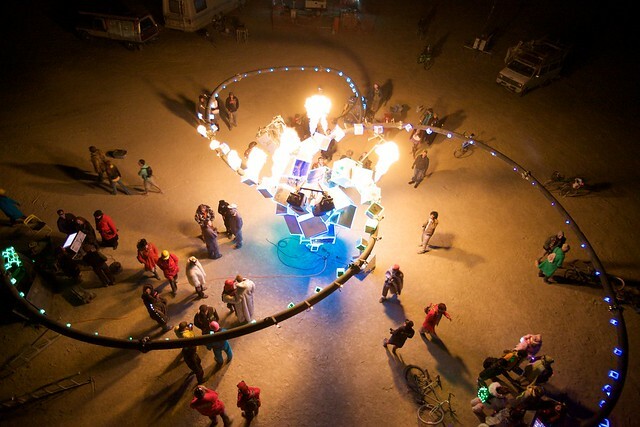 The center of the circle is a huge metal tornado of cubes, pulsing with synchronized sound, light, and fire. The Syzygryd team had musicians submit sets of music created in Ableton live, for people to trigger using the grid sequencers. Each set would have 3 instruments, one for each sequencer. The length of the sequence is only 16 bars- one measure of music. The participant playing with the sequencer would dictate the melody of that measure, meaning that the melody has the potential to change constantly. But what about the rest of that measure? Could I really listen to the same sounds over and over again for the full 20 minutes that the set was meant to be played for, and not get bored? I decided that I wanted to do something to randomize my work, so the sounds would not get repetitive. For that, I needed the help of the most serious ableton badass in my rolodex: Juan Segovia. When Juan and I sat down to work on this thing, we knew that two of our three instruments were going to be cello and drums. We started with the cello, and I found myself playing the same scale 5 different ways. I played pizzicato (plucked), arco (bowed), tremello (rapidly moving the bow back and forth), with heavy vibrato, and playing harmonics. We then told Ableton to use one of these styles at random, while keeping the melody the same. This way, when the user inputted a melody, they would always get the notes they asked for, but the style of playing would vary each time! Here is a little video of us putting this together, where you can easily hear the notes changing styles as the measure loops. ThisIsStar & JuanLittleDevil: Composing for Syzygryd #1 from Star St.Germain on Vimeo. This took us a very long time to do. For the Ableton-minded who are curious, we achieved this by setting each different style as a level of velocity for our midi track, then set the velocity to random. Here’s another little video that shows off our third instrument, a music box, a bit better. ThisIsStar & JuanLittleDevil: Composing for Syzygryd #2 from Star St.Germain on Vimeo. When I got to Burning Man, I packed all my good cameras and microphones to capture some video and audio of the sculpture playing the music that Juan and I had created. Unfortunately, when I arrived, my set would not load on the sculpture! I sat and waited as the team kept trying to pull it up, only to have it crash the sculpture every time. After all that, I went home defeated and disappointed that nobody had heard our work. Apparently, there was a point at which our set played- and some random person just so happened to have taken a video and put it online. I am looking forward to trying to get better documentation of our work the next time the sculpture runs, in a more local setting. Juan and I are also planning on making more sets for Syzygryd, as well as other music. Speaking of music- I have a hugely awesome thing to share with you on Monday. Be sure to check back then! Very cool looking sculpture and concept behind the “mixed media” here. My buddy was at this Burning Man event and told me about it on a podcast I recorded. Sounded like he enjoyed all the nifty artwork. He said it was more creative than most stuff he’d seen that could be called contemporary art or whatever the post-post -modern term is. That was your set? I heard it a number of times during the week. It was one of my favorite ones!